Still avail. 1 month free. Furnished Sunny and spacious 1 bedroom apartment in well maintained co-op buidling! Furnished rental! Oversized apartment - big enough to create home office! Beautiful open pass thru kitchen with quartz counters make it a must see! Newly renovated building hallways! Gorgeous light and closet space! Stunning roofdeck!City views from living room in the Southwest! River and bridge views from the bedroom facing Southeast!Custom cabinetry! Marble bathroom! Outstanding closet space including walk-in. Perfect for entertaining. Quiet, high floor, split plan layout offers maximum privacy. 24 hour doorman building with smartboard pkg alerts, gym and roof-deck.Live-in super and neighboring garage. About 5 min. walk to Central Park, wonderful restaurants & public transportation! 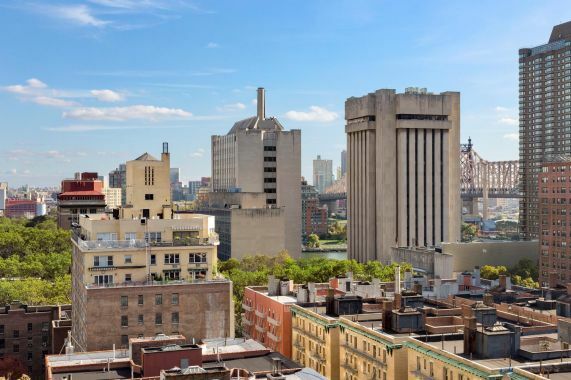 Conveniently located to FDR and area hospitals, take the crosstown bus to Lincoln Center, the Metropolitan Museum of Art or stroll along the east side promenade!And the wonder of it all... is you won't realize your renting! This is home!